The Internet is a relatively recent invention, but it is transforming our world at an accelerating rate. Personal computers have democratised access to information and resources, and social networks have opened up opportunities and connections and new ways of working. Digital technology has impacted on or been integrated into almost all products and services. In this sense, every company is now a technology company and every job is a technology job. Many jobs are now being automated or replaced completely, and new jobs are emerging at a rapid pace. Due to the digital transformation, vast changes will affect the way we now work and how we will be working in the future. Reports estimate that between 45 per cent and 47 per cent of current jobs could eventually be lost to automation, while the number of new jobs created will also soon prove to be finite. It is predicted that seven per cent of this total job loss will occur by the year 2025 and according to the World Economic Forum we have less than five years to adapt to a new reality. With so many imminent changes we need to update our perspective and understanding of the future, to envision what lies ahead in the area of work. If many of the tasks that we do today will become automated, what skills should we be learning? Skills that are typically human? 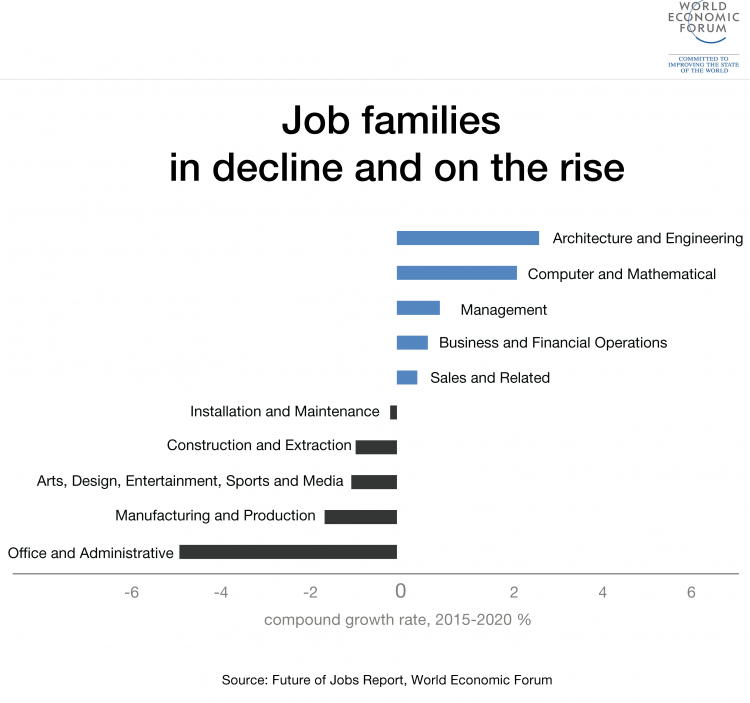 According to the World economic forum, the jobs that are on the rise are Architecture & Engineering and Computer & Mathematical. Although these are left-brain fields the social side is also very important. Social skills, or the ability to interact with others, are vital. If we will be living longer, as predicted, this means that we also will be working for approximately sixty to seventy years. The average company lasts ten to fifteen years, which means that many people will have to learn a new profession four or five times during their life. This is a massive shift away from the traditional idea of learning a single profession, having one job and staying in it for decades. Education and training systems need to keep pace with the seismic shifts that are taking place and today’s students have a fundamental role to play as change agents for education. It is important to create learning environments that are connected to each individual’s development, background, interests, and experiences. Likewise, to create personally relevant and motivating learning experiences, socially engaging learning environments and to provide access to all personal learning on a mobile device. Claned is a personalised learning platform powered by artificial intelligence and providing educational experts, enabling individuals and organisations to maximise their learning results. Companies are starting to break down into collaboration networks of smaller organisations, while the pool of people who work temporarily for a business is growing. Sometimes they work alone, sometimes in teams. Companies choose from a pool of talent and work with teams of experts that bear the responsibility for the project and do not need a manager. When the job is completed, the team is dissolved and people will continue working on another project. There will be a constant search for new talent, sometimes for a project, sometimes for a few years. New jobs will arise in the areas of training people and staffing. It is all about finding the right people with the right skills to put in the right positions, in order to realise evolving goals. A more project-based way of working has an impact on our work and living spaces. Now that technology allows us to work anywhere there is a rise in temporary and flexible work and temporary living spaces. Companies such as WeWork offer shared office space and last year they expanded their business with WeLive, a community living place where you can move in for months or stay just a few nights. 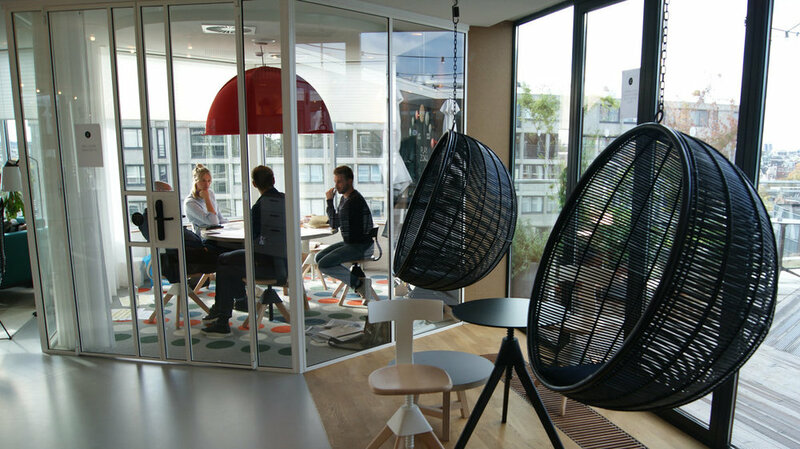 Other companies like Zoku Amsterdam share the same concept of creating housing for entrepreneurs and creators. Alongside offering flexible workspaces and living spaces, there are spas, gyms, movie rooms and healthy restaurants. Think long-term about imminent changes to the way we work in order to prepare for the future. Reconsider how jobs are designed and prepare to adapt and learn for future business. Cultivate an attitude of lifelong learning. On average we should be investing 5 hours of our time on a daily basis in learning new skills, so as to keep up with developments in society. Technological developments affect our way of working and this has a ripple effect on other areas of our lives as well. Prepare and adapt, consider the implications for your business.